In spite of the problem of not having a schematic here, we will use a simple Excel file that you can download to produce plots to visualize how a mixer works. Click here to go to our download area and plot your own waveforms at the RF and LO frequencies of your choice! Recall that a mixer has three ports, the radio frequency port (RF) port, the local oscillator port (LO), and the intermediate frequency port (IF). 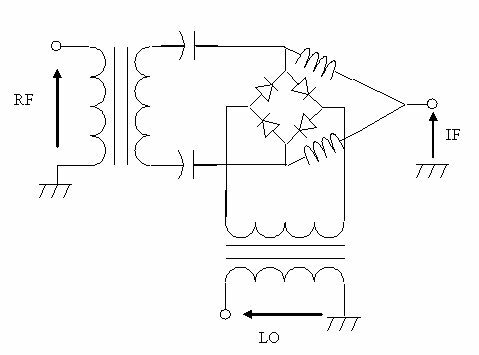 The LO signal is the strongest signal, and is used to turn the diodes "on and off", which effectively reverses the path of the RF to the IF (again, we wish we had a schematic...) The RF signal is modified by the LO signal, and its waveform is filtered to become the IF signal. 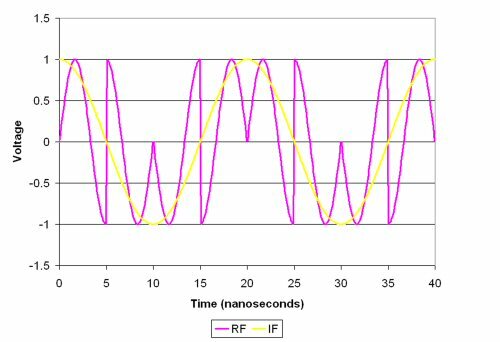 In the figure below, you can see the RF and LO waveforms. In this case, the RF is at 150 MHz (period is 6.66 nanoseconds), and the LO is at 100 MHz (period is ten nanoseconds). We don't have to tell you that period is (1/frequency), do we? Although we have pictured the RF and LO voltages as equal to unity improve the visualization, remember that in real life the LO usually much, much higher in voltage amplitude. In the next plot, you can see the effect that the LO has on the RF signal, as it is passed to the IF port. The mixer acts just like a 180 degree phase shifter, with the LO signal as the drive voltage. 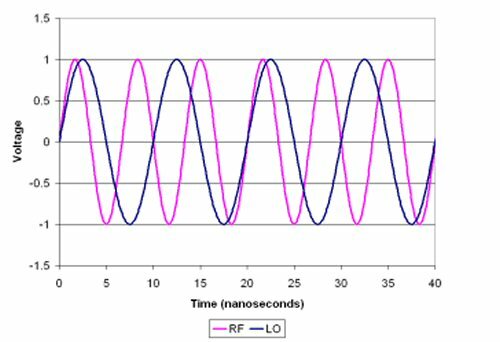 When the LO signal is positive, the RF signal is left alone. But when the LO signal is negative, the four diodes are conducting in the opposite sense, and the RF signal is inverted. In the plot the LO signal is dotted; you can see an instantaneous phase shift a five, 10, 15, etc. nanoseconds as it crosses zero volts. Now squint your eyes and ignore the dotted LO signal. Don't let anyone see you do this or they might think you have gas... You will see a waveform that is quite ugly, but is obviously periodic at 20 nanoseconds (50 MHz). Why couldn't you use a 180 degree phase shifter as a mixer? It is possible that in some applications you can, but keep in mind that there is often a limitation in how fast you can switch a "normal" phase shifter, a mixer is designed so that the LO signal is not choked before it hits the diodes. The final step is to smooth the IF signal with a low-pass structure. You can see the effect in the plot below, here the smoothed IF signal is yellow. Voila, you now know how a mixer works!! !